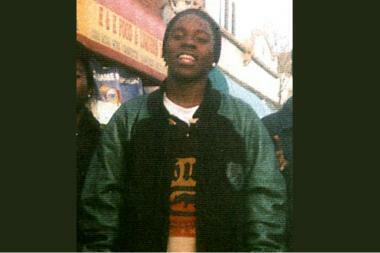 Aaron Harrison was shot and killed by police in 2007. A jury awarded his mother $8.5 million in wrongful death civil case Thursday. DALEY CENTER — Jurors who awarded a mother $8.5 million late Thursday in the police shooting of her son re-enacted the 2007 shooting in the jury room and decided the police explanation didn't add up, a juror told DNAinfo Chicago. It took the Cook County jurors just three hours Thursday to rule in favor of the mother of Aaron Harrison, 18, who was shot in the back during a police chase on the West Side. His death led to angry protests, with neighborhood residents throwing bricks and bottles at police. Juror Jeffrey Topps, 50, said jurors struggled with the idea that a police officer might not have been justified in shooting a teen, but eventually came to the conclusion that the shooting "could not have happened the way police said it did," Topps said. "[Harrison] couldn't have been shot in the back if he was turned around, pointing the gun. I said it over and over," he said. On a warm summer night in August, 2007, two police cars on special patrol in North Lawndale pulled up to a group hanging out at the corner of Roosevelt Road and Francisco Avenue. Officer John Fitzgerald, testifying Thursday, said he saw a man who he believed had a gun in the group. "I observed a person that I now know to be Aaron Harrison look in my direction, place his hand near his waistband and move a weighted object … what I believed to be a gun," Fitzgerald said. Fitzgerald got out of the car and gave chase before encountering Harrison in an alley. Fitzgerald testified that Harrison pointed a large, chrome gun at him while running and refused to drop it after being ordered. "In my mind [I am thinking], 'Oh s---, I am going to get shot.' I mean, that's just how it is," Fitzgerald testified. "It's a snapshot that you'll never forget." Fitzgerald fired one shot that entered Harrison's back, severed his spine and exited through his neck. He died instantly. The shooting was later ruled a justifiable use of force by the Independent Police Review Authority. Fitzgerald said he saw Harrison's gun hit the ground and bounce after he was shot. Police said a black 9 mm handgun was found near Harrison's body. Witnesses called by the attorneys for Harrison's mother, Annie Johnson, testified they didn't see Harrison with a gun, however. The attorneys for Johnson alleged there was police cover-up, asserting Harrison was unarmed. They called a witness who said a gun "suddenly appeared" next to Harrison’s dead body. Some on the jury initially struggled to accept the idea of ruling against an officer whose job is to serve and protect, Topps said. Jurors acted out the shooting as Fitzgerald said it happened. "Those jurors got past the initial hard time they had believing the officer did anything wrong," Topps said. He also said two of Fitzgerald's fellow officers "were less than credible" on the stand, including the officer who said he saw Harrison running, gun in hand, but did not radio his partner to warn him or draw his own weapon. "The more they talked, the less sense their story made," Topps said. It was the second civil trial in the case. The first ended in a mistrial in May when the jury deadlocked. Harrison's mother, Johnson, said she decided to take on the city and the police officer who shot her teenage son in the back, but she didn't expect to win. "I had the sense that nothing would ever happen to the [officers involved]," she said. "I didn't want to give up on my child. It's always worth fighting when it comes to my children." Many times over the course of the last six years Johnson said she felt like giving up. "I think there's a lot of cops who think they are above the law," she said. "I think they probably get away with it a fair amount. But people should stand up for themselves." Jim Montgomery, Johnson's attorney, said the mother's victory is a rare one. "It is very tough to prove the plaintiff's case," he said. "In most [police-involved shooting] cases you don't have independent witnesses to see the occurrence. In this case, we were lucky enough to have five eyewitnesses ... and it was still an uphill battle." Montgomery said Thursday's verdict is also a victory for communities around Chicago where people believe there is no recourse when police go too far. "The real winners are all the people like [Harrison's] family who have gone through it," he said. After the verdict, Fitzgerald hurried out of the courtroom to the hallway, where two of the other officers involved in the case were waiting. He declined to comment. The $8.5 million judgment is on top of the $54 million the city already has spent this year on police misconduct lawsuits, the Tribune reported in mid-July. Fitzgerald's attorneys referred questions to the Chicago Law Department, which was not immediately available.